I took another week off of running (the first was immediately following the half marathon), and last Friday was my first day back. I hadn’t necessarily intended to take the week off, but it happened. Turns out it was a good thing. My legs never really seemed to bounce back after the half, specifically my hamstring has been acting up. But after this additional week off, I’ve got some spring back in my step. The last three runs I’ve done, my hamstring has felt perfectly fine. Hooray! I don’t know if I’m completely back to normal, but I’m going to keep up with my strength exercises and stretching and hope for the best. Friday and yesterday were both easy two mile runs. Short, sweet, and not much to talk about. Sunday on the other hand, was longer and much more interesting. 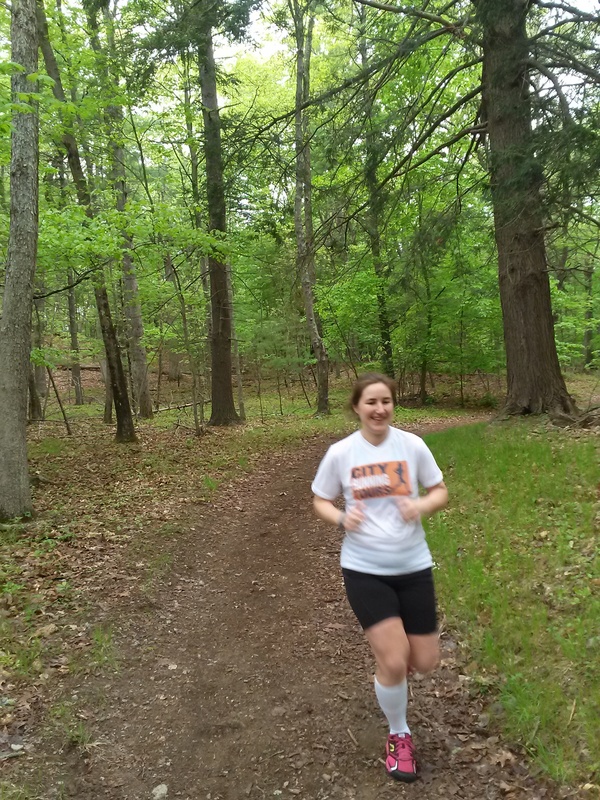 Because it was my first ever trail run! A couple of weeks ago I got it in to my head that I might want to try an easy trail run. I brought it up to Jeff, and as it turns out, he was interested in trying a trail run as well. 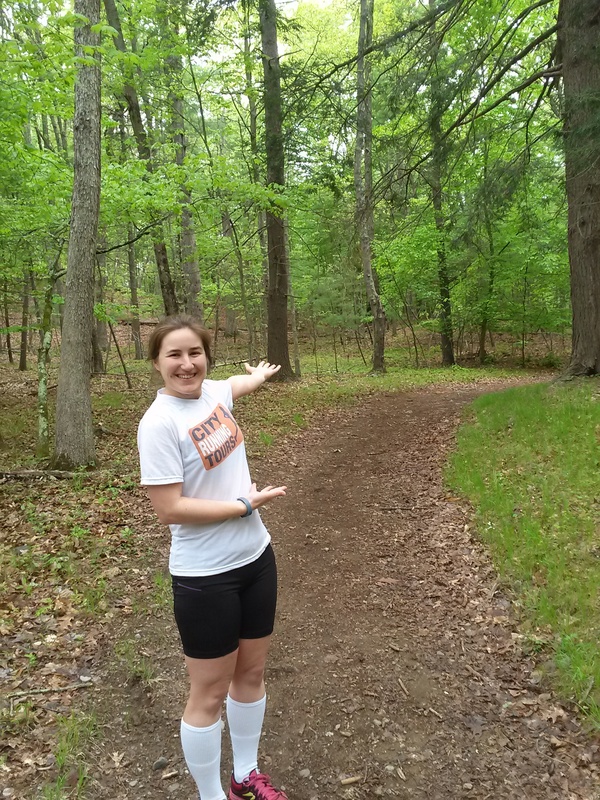 I found a nearby trail and we picked a day and headed out on an adventure. Let me present: Willowdale State Forest! Our plan was to run for 30 minutes and then find a place to eat a delicious picnic brunch of fruit and bagels. Things didn’t exactly go according to plan. 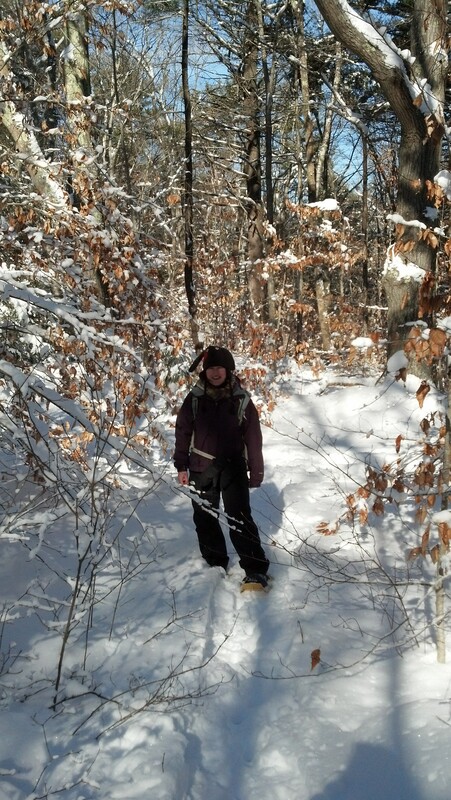 This was our first time at this forest, and it was not marked nearly as well as the one we snowshoed this past winter. That one has paper maps available at the trailhead and is very well marked throughout. This one, not so much. And there were lots of forks and turns. Can see where this is going? 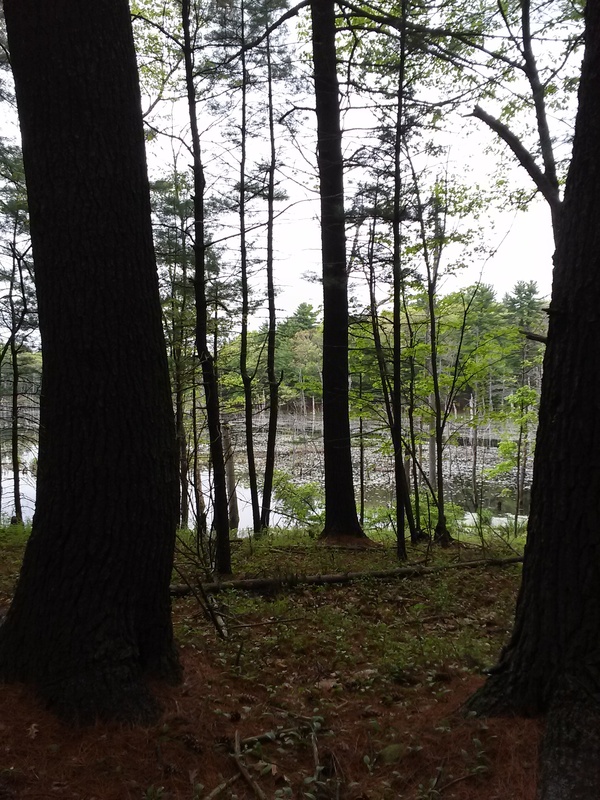 At some point in our adventure, we got turned around, and at the 30 minute mark when we checked our location on the GPS, we found ourselves at the entire other end of the forest. Oops! So we headed back in, and checked our direction at each fork, heading back towards the car and our delicious bagels. We didn’t know exactly which way we had come, and were not heading back on the same path, and after another 30 minutes we were still not back at the car. Surely this path leads out of the forest? You’d think that doubling our running time would be a problem, but as it turned out, we both felt great! The weather was cool and overcast, and the softer surface of the trail seemed to go a long way in keeping our legs fresh. While it was starting to feel like we were perhaps never going to get out of the forest, it was still a beautiful and fun adventure. There were several points along the way where we were close to the road and/or people’s houses, and not too long after hitting the hour mark we decided to take advantage of being close to an exit and we left the forest to finish our run on the road. I’m sure we could have made it back on the trails, but who knows how long that would have taken. When we finally reached the car, we’d been gone for an hour and forty minutes, and what I estimate as approximately 8 miles of running. We were both shocked and pleased with how well we did over such a distance considering how our legs have been feeling. Even though we got mixed up (I wouldn’t exactly say lost since we didn’t really have a plan), I had a great time and can’t wait to go trail running again. Maybe next time we’ll try the better marked trail where we snowshoed this past winter. I’m sure it will look totally different without the snow. 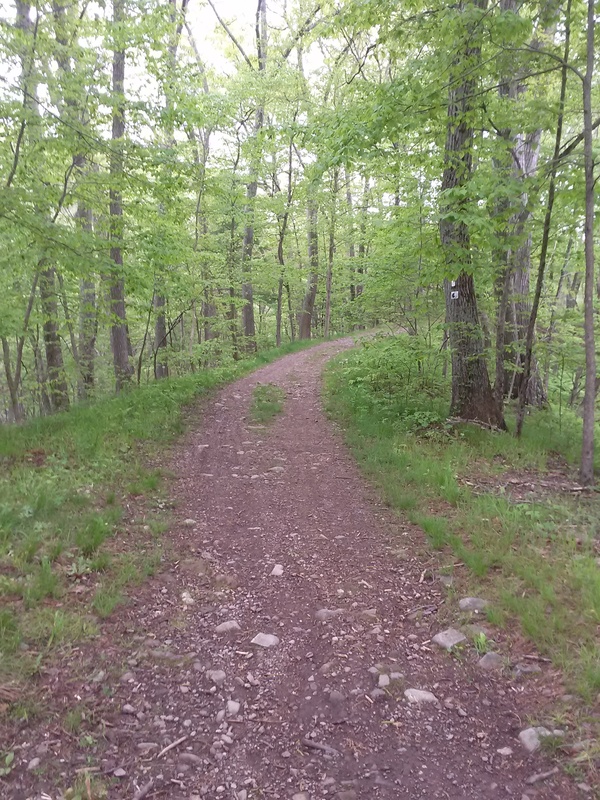 Before this weekend, I’ve really not had much of a desire to run trails. I don’t really like nature very much, (bugs, animals, poison ivy, etc. ), and I’ve been afraid of tripping and of getting lost. While I can’t say that none of these things was a problem, they weren’t really as bad as I thought in my mind. This forest has a fire access road which is where we ran for the most part. This was wide enough to be able to run side by side, and the trees and plants were not right on top of us. This kept nature far enough away from me that I could relax and enjoy myself. Also, because the trees were further away from us, tree roots weren’t really a problem. While it was more tricky than running on a path or road, and I kept my eyes down for a lot of the run, I didn’t fall and I didn’t feel unsteady for most of the run. See, plenty of space between me and nature. However, while trying to get out of the forest we ran into some paths that were single track, and these parts were not fun for me. I felt too close to the trees, there were tons of roots, and for some reason it was also hillier in these areas. I will definitely avoid single track trails when I have the option in the future. It’s just not for me. As far as bugs and other animals, we didn’t really have much of a problem. The bugs weren’t an issue except when we stopped to check the GPS. If we were moving, they weren’t really noticeable. The only other animal we ran into was a frog, and it startled me quite a bit. I thought I was about to put my foot down on a leaf when it hopped and I realized it was actually not a leaf at all! I yelped, and then obsessively checked for frogs the entire rest of the run. I bet there are millions of frogs living in that little pond. Just waiting to hop out and croak at me. The last thing I want to note about the trail is that apparently people horseback ride here. We didn’t see any actual horses, but there was a fair amount of horse poo on the trail. While some people might find this gross, we found it hilarious. It was supremely entertaining to holler out “poop”, “watch out for poop”, and “poop on your left” every so often. I laughed every time. In the grand scheme of things, the frog was way more disturbing to me than the horse poo. All in all, I really enjoyed the trail running, and I think my legs really loved a break from the roads. I look forward to my next chance to give it a try, and I think it will only be better when I know what to expect. Looks like you had a nice time! I need to explore some trail options around me, because right now all I run is pavement, and it’s bound to result in some pain eventually. It was fun, you should give it a try! I don’t necessarily have problems running on the pavement, but it was amazing to me that I actually felt noticeably better not doing it. If that makes sense. I can definitely see how they would be hard. Especially the single track trails or ones up and down hills, but if you can find some with a wide path; it was actually pretty easy.